Simply Beautiful! I would give it 6 stars if I could! There is a danger in making video adaptations of classic books, particularly those of Jane Austen and Charles Dickens -- the problem is that of showing *action*. Many of these stories revolve around well-dressed people standing around talking in plummy accents. There's very little in the way of derring-do or even positive movement, apart from the characters traveling from place to place. Period-pieces like this can turn into boring talkfests if the director and actors aren't careful to keep things dynamic. Also, Dickens' sprawling plots and large casts of characters make a film adaptation difficult. "Bleak House" in particular is a difficult work to translate to film, containing as it does so many characters and so many interwoven plot threads. The filmmakers of this version of "Bleak House" did a good job of translating the very long and complicated book into a fast-paced miniseries. All the familiar characters are there: the loathsome Tulkinghorn, the strong-willed Esther Summerson, the young lovers Ada and Richard, the batty but lovable Miss Flite, the haughty Lady Dedlock, and my favorite of them all, Inspector Bucket. The book's sprawling plot is sintered down to the essential elements and characters, but the series still runs over fifteen episodes of a half-hour each (exept the first, which is an hour long). The production is very well-mounted and shot, but with a rather odd editing style more reminiscent of modern police dramas than period pieces like this one. Gillian Anderson is a revelation as the tragic and desperately unhappy Lady Dedlock. I was a bit dismissive of her casting in this role -- I thought it was a sop to pull in the American audience -- but she does a wonderful job. Her Lady Dedlock is cold and aloof and haughty, but always with a trapped-animal panic behind her eyes. It is really a wonderful performance. Charles Dance brings a cold menace and basilisk gaze to the lawyer Tukinghorn, while veteran actor Alun Armstrong brings his worthy talents to Investigator Bucket. Anna Maxwell Martin's Esther is more problematic: her character seems rather pallid and underacted, her emotions too stilted. But overall her performance is good enough that it doesn't detract from the piece. Hides Mr. Dickens's true message. The other 1985 version Charles Dickens's "Bleak House" brings to life so well the truth that trial-lawyers are a Cartel, in business only to make lots of money for themselves, and Judges are chosen solely from that group of self-serving, money-grubbing, trial-lawyers. The trial-lawyers and Judges are skilled at stringing the young man along, making him believe if he just files that one more document, and explains his case a little clearer, that he will receive justice. But the trial-lawyers are not in the business of justice; they are in the business of making more and more money. The young man is strung along by the trial-lawyers for years, his health ruined, his relationships with family and friends ruined, for his being strung along to exhaustion. We see the young man depends upon his belief that our civil Court system must have some justice. When the young man's life has been totally ruined, and the trial-lawyers further enriched, the truth is finally revealed to the young man. There is a humorous scene at the end as he reacts; though not funny if it was happening to you. The other 1985 version is the best version, though very slow. They should remake "Bleak House" with my suggestions under the comment button below. I liked the other 1985 version, because I have been to civil Court, and found the other version true to life. This 2005 version shows the main character's home with dark furnishings, filmed by candlelight, for a bleak home, to hide Mr. Dickens's true message. Mr. Dickens said the civil, Court-house is the bleak house, for the greed and the corruption. The other 1985 version makes the house of the good characters cheerful. Bleak House is ongoing today. Any Judge is a lawyer, and is biased to preside over a case of a citizen, non-lawyer vs. a lawyer. Any Judge is further biased in a case of his employer and his fellow-government-employees, in a case of a citizen vs. the government. The Judge is obligated to order the complaint and motions to a jury for decision without delay or opportunity to dismiss. But the Judges do not do that. According to a former US Supreme Court law-clerk, in the books noted *below, Supreme Court law-clerks write the opinion-decision that the justices have made. Lower federal and State Courts have taken this opportunity one step further. Lower Court law-clerks decide and write the tentative-rulings and final-rulings of the cases of non-attorney plaintiffs, without the Judge ever reading the non-attorney's complaint. The decision is stamped with rubber-stamp or computer-stamp of the Judge's signature. The Court law-clerks esteem their fellow attorney, who is opposing the non-attorney plaintiff, for the attorney's successful private practice; and always rely upon the attorney's pleadings to make their decision; disdaining the non-attorney plaintiff as knowing nothing about law. Though, in truth, all good law should be ethics and simple business rules, like having a written contract, thus the uneducated, non-lawyer, plaintiff, should find honesty and justice on equal ground. The Judges act in secret, by procedures that are not verifiable or transparent, in unlawful-position where unlawful acts are presumed to occur, against non-attorney plaintiffs. "The Congress shall make no law...abridging the right of the people to petition the Government for a redress of grievances." The profession of "trial-lawyer" attracts those wishing to make a lot of money; the greediest among us. Trial-lawyers have usurped a monopoly, effectively stealing the poor person's right to a just hearing under the Constitution. Justice only for those who can pay the high prices! Trial-lawyers get rich upon the misfortunes of their neighbors. Judges are trial-lawyers. Since the trial of Jesus, to the days of Charles Dickens, to today, as Solomon said, "nothing is new under the sun". You may say, "Abraham Lincoln was an honest trial-lawyer". True, but the last honest one in the history books, and he was shot for his honesty. Jurors in the OJ Simpson trial were locked in a hotel room for 4-months, for a trial that should have taken two days to present to the jury. The jurors soon thought, who cares about this case, let me out of this hotel room. The moral of "Bleak House" is to not spend too much time on the corruption that we honest folks cannot change, and not to let the trial-lawyers steal our enjoyment of our loved ones. While flipping through channels one day I accidentally came across an episode of Bleak House miniseries. I was riveted! The characters are engaging; the plot, though a bit overdone at times, exciting and you totally get caught up in the story so masterly woven around you that you completely lose yourself in it. My fianc¨¦e had recently finished Dickens' novel when I saw this adaptation for rent, so I picked it up for her, not really intending to watch it myself. She is quite the fan of Dickens, having discovered him not long ago and is impressively working her way through his catalog. As for myself, I've enjoyed the few novels of his that I've read, but as far as the adaptation goes, when I see the words 'BBC' and 'Classic Literature', my eyes start to glaze over. No worries though as I was caught up in the series almost immediately. Dickens always was a bit keen on melodrama, considering most of his output was serialized in the papers first, and 'Bleak House' might even outdo some of his other works in that regard, but that's a minor distraction if at all. What makes the adaptation stand out so well, in my mind, are both the casting and the editing. 'Bleak House' is a sprawling novel, filled with rich characters that can be difficult to keep track of if you don't pay attention - at least at first. As an 8 1/2 hour miniseries though, the director had time to explore these people's idiosyncrasies and help the viewer differentiate between them. But what faces the casting director found! Several times throughout the series, both my fianc¨¦e and I commented on the actors and how they very nearly carried their roles on their face alone. I'm sure the magic of makeup had a lot to do with this also, and the actors themselves did excellent work, but still I was amazed at the variety. Perhaps I'm a victim of Hollywood's generic casting, where, if you aren't the star, then the goal is to find the most non-descript faces around so there isn't any doubt as to who is the leading lady or leading man. Not only is 'Bleak House' filled with dozens of important characters, it is also a complex story - mostly written as a condemnation of the British court system at the time. The directors chose, wisely I think, to concentrate more on the story of Esther Summerson, an orphan with a mysterious past. Keeping these storylines from helplessly tangling with one another was a major success, one that I think you can point to the film editor for. I won't say it was perfect (the crashing sounds accompanying the jerky transitional establishing shots got to be a distraction by film's end), but each brief segment of the story served its purpose by advancing the plot and keeping up interest. I thought it struck a fine balance between catering to those with no attention span and those who are patient enough to let a film unfold at its own pace. My fianc¨¦e and I rarely find much to watch on TV to begin with, and if we do, it's about 50/50 as to whether we'd both enjoy it. 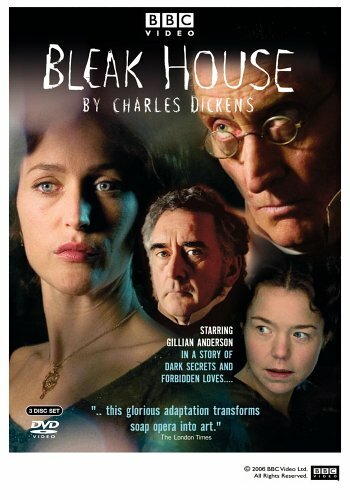 As a period drama and romance fan, she heartily endorsed 'Bleak House', while even a Texas Chainsaw Massacre fan like myself found it engaging and fun. Highly recommended. I saw Bleak House in part watching Masterpiece Theater on PBS some months ago, but somhow managed to miss the conclusion. Which left me painfully eager to know how it all came out. And so I was thrilled to find it available through my online rental service. I am a Period Film addict and for the most part really enjoy when classic novels are brought to screens, big and small. The BBC has in my opinion an unrivaled talent for this, and has created some of the most beautiful and faithful adeptatians I've seen. So as I say having seen some of the miniseries already, My expectations for the ending were quite high, but even so Bleak House left me utterly speachless. Every aspect of this film is incredible. The film as a whole is almost indiscribably good. The Acting was superb from top to tail, everyone seemed to inhabit the very skin of their charater, but even amoung these there were performances that knocked my over. Gillan Anderson, as the ill fated Lady Deadlock. Anna Maxwell Martin, as the indomitable Esther Summerson. Burn Gorman, as Guppy I couldn't help but like him. My hands down favorite scene: (for the benefit of those who havn't read the book, or seen the series) A certain mother daughter reunion. as Compulsively watchable as the BBC's Pride and Prejudice, you really gatta see this. I Don't Care If You Hate Dickens - BUY THIS! I am not a Dickens fan, and I think Bleak House as a book is almost unreadable. But this production takes that book and makes it into a TERRIFIC series. All the performances are great, but the "Show Stealer" is Anna Maxwell Martin as Esther Summerson, the lead character/narrator. Ms Martin is "Letter Perfect." Once when C.S. Lewis (my favorite author) was asked in a letter which was his favorite Dickens novel, he said "I think I'd have to place 'Bleak House' at the top." Suffice it to say that this wonderful BBC production does justice to Dickens' magnificent literary work -- and that is no mean achievement. Some have objected to the modern stylistic touches utilized in the filming, but I rather enjoyed them, and never felt they took away from the altogether classic nature of the story. The acting was superb all around, the writing superlative, and the original material (thank you, Charles) is some of the finest the English language has given shape to. I hesitate to single out any of the performances from the rest (so fine were they all), but if pressed I might say that Martin, Lawson, Gorman, and Dance were so excellent they could hardly have been better. But several others were also terrific, and there was no weak link in the chain. Since it is not often mentioned I might add that the musical theme, with its intriguing air, maintains the high standard of this drama. And finally I ask, was not Charles Dickens one of the greatest namers of characters the world of literature has seen? Dedlock? Skimpole? Tulkinghorn? First-rate, that! Good luck finding eight hours of television viewing as edifying as this BBC high-water mark, BLEAK HOUSE.